Are paid links dead as an SEO strategy? Instant results are always the most appealing. When it comes to SEO, climbing up the SERPs can take a lot of time, effort and money. A popular technique amongst some marketers for acquiring the inbound links that search engines like Google love has been to pay for them. But getting results from this approach is increasingly difficult as Google becomes more adept and identifying paid links and penalizing those websites that are buying them. Given that the logic behind Google’s PageRank algorithm is that a website should be receiving inbound links because that website deserves them, Google’s efforts to blunt paid links is not surprising. Unfortunately, while an argument could be made that paying for links, when done appropriately, is a legitimate tactic, paid links have been on Google’s radar for years now and have been discussed on Econsultancy in the past. Yet recent discussions of paid links on Search Engine Watch make for interesting reads and highlight the fact that there’s still a lot of debate on the subject, although Google does seem to be imposing its will quite effectively. Search Engine Watch’s Mark Jackson notes that while Google’s wrath seems to come down on some while avoiding others who still profit greatly by purchasing links, he advises his clients to be very mindful of Google’s stance on the issue and has seen firsthand the negative impact a Google penalty can have on websites. In a recent post, Eric Enge of Search Engine Watch details a panel discussion that he participated in. Both white and black hat SEOs came to largely the same conclusion – don’t risk too much if you go the paid links route; invest in building real results over the long-term. Clearly, the overall sentiment has shifted towards a growing consensus that paid links are risky, if not outright no-nos. Personally, I have mixed feelings on the issue. Large-scale, indiscriminate purchasing of links, especially as part of an outright attempt to ‘manipulate‘ SERPs, is worthy of contempt, but as Marty Weintraub of the aimClear Blog pointed out in June 2008, Google’s stance is conveniently aligned with its financial interests, namely making sure that the only results that can be ‘bought‘ are those that are purchased through AdWords. But I also think there’s another issue that doesn’t get discussed much on this subject – the impact of Google’s policies on publishers. If a publisher sells a ‘sponsorship‘ to a company, does the link that comes with it put the buyer’s website at risk? It just might if that buyer has competitors who report the ‘paid link‘ to Google. Google’s guidelines acknowledge that “buying and selling links is a normal part of the economy of the web when done for advertising purposes, and not for manipulation of search results” but goes on to instruct publishers to add a nofollow attribute to these links or to redirect links to an intermediate page that is blocked from search engines using robots.txt. This highlights that despite all the amazing things Google’s algorithms can do, it still wants and expects publishers to help it out. For the many publishers and advertisers who don’t even know about Google’s guidelines, a lack of awareness could be very costly. For those who are aware of Google’s guidelines but don’t feel like going out of their way to help Google do its job, the anecdotal evidence seems to indicate that erring on the side of caution is a prudent thing when it comes to paid links, even if it’s not fair. In other words, caveat emptor. ‘Disruption‘ is one of those words Silicon Valley entrepreneurs, VCs and observers have come to love. 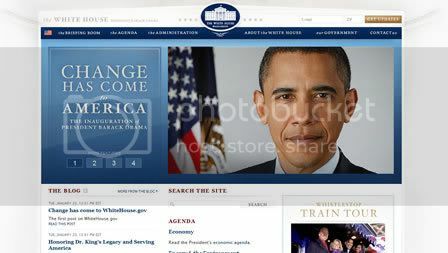 Talk about a launch: minutes after Barack Obama took his oath and became the 44th President of the United States of America, a new Whitehouse.gov launched. And it appears that President Obama, who made extensive use of the internet as a presidential candidate, will continue to use the internet as the most powerful man in the world.